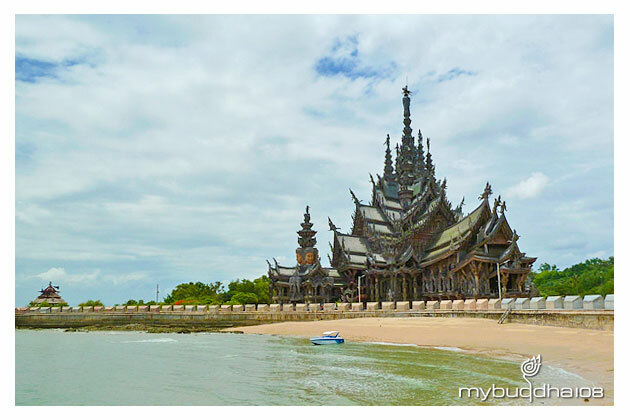 Sanctuary of Truth is located in north Pattaya, Chonburi province. Also called Wang Boran and Prasat Mai. A huge wooden construction temple-like structure entirely made of teak wood and carved with traditional Buddhist and Hindu motifs. The building, which resembles a temple, is close to 105 meters (345 feet) high. It features contemporary Visionary art based on traditional religious themes. The project was initiated as an idea of Thai businessman Lek Viriyaphant in 1981, and is scheduled to be complete in 2025. The building was constructed according to ancient Thai ingenuity and the style of the ancient Khmer architecture such as that at Angkor and entirely covered in hand-carved wooden sculpture. It has four gopuram, respectively representing images from the Buddhist and Hindu religions and mythologies of Cambodia, China, India and Thailand. The purposes of decoration with wooden carve sculptures are to use art and culture as the reflection of Ancient Vision of Earth. Within this compound, visitors will understand human responsibility, life relationship with the universe.